There was always, of course, that refreshing air of boyish charm about him. The eyes filled with concern, the presence of an active listener, the ever ready smile – and yes, sometimes sympathy or laughter. Above all, Antonio continually conveyed a sense, and a sincere sense, of congeniality, cordiality, and most wondrously, camaraderie. We miss him not just because those civil qualities are found so rarely amongst so many in our twenty-first century world, but because Antonio so completely and magnificently lived those qualities in all aspects of his life. 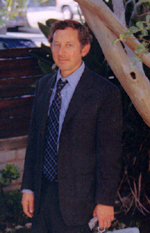 Beginning with the experience of his first candidate interviews for the position of Music & Media Librarian at CSUN in the spring of 2002, all of those involved in that process knew beyond any doubt that we were indeed in the presence of a truly special colleague. The Committee charged with selection for that position and the then-Chair, wanted to hire him immediately – on the spot. That is most unusual, to say the least. How incredibly fortunate the students and faculty of this University and the users of this Library are, that we were able to bring Antonio to campus and have him here for some time, whatever time, at all. And what accomplishments he assembled and achieved in so brief a time! He engaged the faculty and students in the Music Department, on the part of the Library, as had never been done before. He rebuilt and extended the Music Collection, particularly into new areas of expression and especially, and as well as, into multicultural interpretations. Antonio reorganized, revitalized, and reanimated the Music & Media Service Desk. He successfully planned and launched the implementation of electronic reserves. He provided library instruction to countless music classes and to a wide range of disciplines and groups beyond. He was always ready and more than willing to accept extra reference desk hours in cases of emergency and need. Antonio was selected and served as a Visiting Expert Librarian at Nanjing Normal University in the spring of 2004. He was instrumental in the establishment of a masters program of study for Librarianship on this campus. And, of course, there was, perpetually, music. Music, music, music! 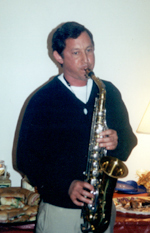 Antonio was an accomplished master, especially of saxophone and guitar. He shared those personal gifts and talent freely and often. He extended his love of music through work with other colleagues in the Music Library Association, both at the national and regional levels. This very year, Oviatt Library and this University recognized, and in an exhibition, celebrated Mozart because of the diligent efforts of Antonio Calvo. As a colleague – librarian, musician, teacher, and friend – Antonio Calvo is and was one of a kind. We shall not see his like again and we are forever haunted by that loss. Why is his loss such a terrible blow? Certainly because of his youth and all the joys and contributions that will now go unrealized in the wake of this tragic death. Maybe also, it is hard too, because we had all grown to take him for granted. He contributed so much to our lives that we had grown to expect that that conduct and presence would always be here. We were unprepared to think that anything else could possibly happen. Then, too suddenly, the saxophone and the guitar lay still, silent, stranded. And while Antonio so often, so beautifully made evident the really valuable elements of life – those actions that really count – his loss reminds us each that our time, as precious as it may be, is ever and always borrowed. Perhaps in the long, long years ahead, when we remember Antonio Calvo and the memories of joy, warmth, friendship, of accomplishments and contributions flood our minds, we shall also realize that everything in life changes. Antonio changed forever the way this Library seeks to serve. Knowing Antonio has changed us each, and for the better. Nothing is static. No one should ever be taken for granted. And though the notes now remain unsung, the beauty and the inspiration of the song linger on.